We recently made Mark Bittman's Roasted Butternut Chowder which we found on this MSNBC recipe page. I liked it a lot. Charlie liked it ok, but wasn't crazy about it. 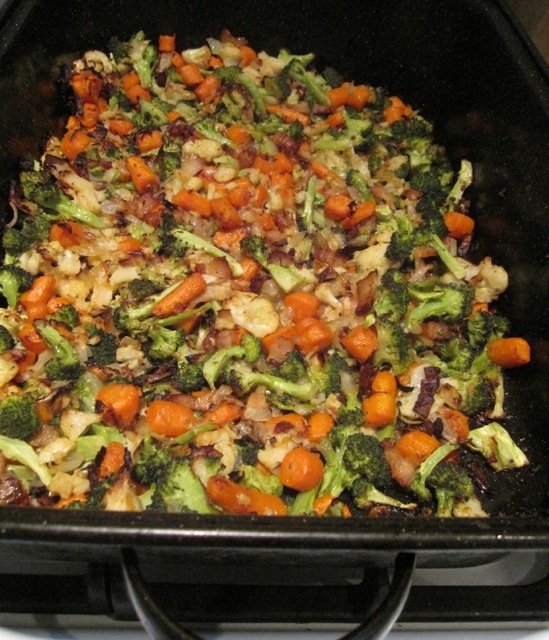 We decided to modify the recipe to use more traditional roasted vegetables. It turned out great. This is what we did (below). Because of the white wine, it tastes a lot like onion soup, but better because of all the chunky vegetables and bacon. Delicious. And easy to make. And thanks to Mark Bittman who is teaching us how to cook some really good stuff. 1 large onion or 2 small onions or leeks, thinly sliced so they separate into rings. Grease a deep roasting pan with oil. Put the bacon in the roasting pan and put it into the oven and let it cook for 3 or 4 minutes. You can stop here if you want and just serve as roasted vegetables (yum), or, to make stew continue to next step. Stir in the sage and white wine and broth. Cook until the vegetables break apart a little and the broth is well flavored, 10 to 25 minutes. Taste and add salt/pepper if desired. Serve with romano or parmesan cheese and (optional) toast. So far we've only made it with carrots, broccoli, green beans, squash, peppers, cauliflower, and cabbage. Other vegetables we might try: brussels sprouts, fennel, turnips. There must be many other things we haven't thought of. If you want a vegetarian or less meaty version, it probably would taste good with vegetable broth instead of chicken broth and without the bacon or with less bacon. As Mark Bittman has said a little bacon goes a long way. Use sausage instead of bacon? Use 2 tablespoons of fresh sage peppers, instead of 2 teaspoons dried sage. If don't have fresh tomatoes, add a little tomato paste, perhaps to the broth? ?